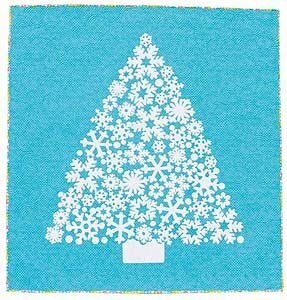 Create a fun, snowflake tree wallhanging to decorate your home for the holiday season. All machine applique, this is a very easy pattern! In class we will attack this project and have time to sew the snowflakes in the second class. You will be given tips and tricks to make a beautiful wall hanging finishing at approximately 40” x 42”. The original was made with a royal ferry frost and a white glitter fabric, but you don’t have to use the same color combination just something light and dark to create a contrast. Bring your fabric and supplies and we’ll get creative together. Our class will include using either traditional tracing and cutting methods, or using a Brother Scan N Cut to assist you in cutting out the appliques.